If there are times when you feel you may not be smarter than a 5th grader take heart; that may not be as bad as it sounds. As states are beginning to release results from the spring 2015 administration of the Smarter Balanced tests we are learning that the score needed to reach Level 3 on the Grade 11 English Language Arts/Literacy test, the very score that is “meant to suggest conditional evidence of readiness for entry-level, transferable, credit-bearing college courses,” the very score that is the goal of the entire college- and career-readiness reform movement, is being reached by fifth graders across the land. From Idaho (18%) to Connecticut (25%), top fifth grade students are earning the college ready benchmark score. How are we supposed to interpret this phenomenon? Are we supposed to conclude that those 5th graders are college-ready? NO. Is this an indication that there is an error in the Smarter Balanced scale? NO. To paraphrase Shakespeare, the fault, dear friends, is not in the Smarter Balanced scale, but in ourselves. We, policymakers and educators, want more meaning from test scores than they can possibly provide. We, assessment experts and measurement specialists, promise more meaning from test scores, even when our science cannot quite deliver on that promise. In short, we promise and deliver a vertical scale; a single reporting scale on which we report test scores from all tests from elementary school through high school. It is the vertical scale that informs us that virtually the same score is needed to reach Level 3, the college ready benchmark, on the high school test (2583) and Level 4 on the fifth grade test (2582). 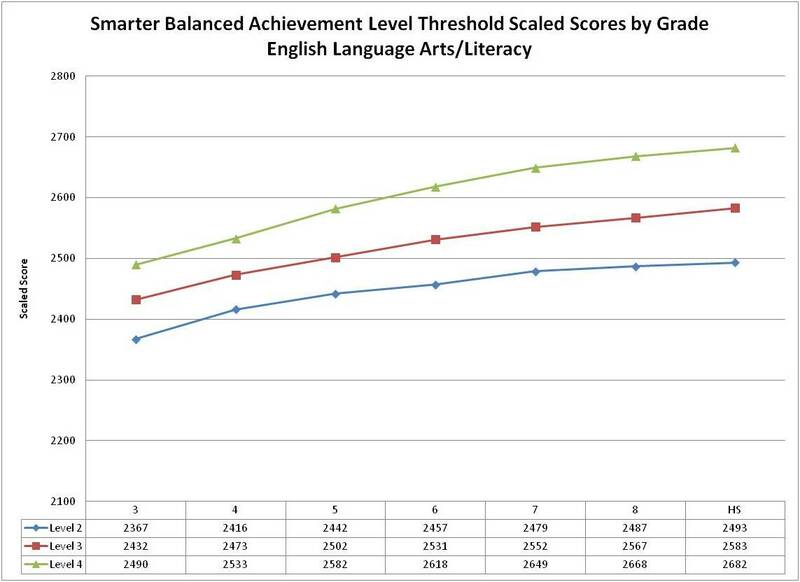 It is the vertical scale that lets us know that it is possible to earn the college-ready score of 2583 on each and every Smarter Balanced ELA/Literacy test from grade 3 through high school. the gap in scores between grade levels will narrow considerably as we reach middle school grades. Those two characteristics are found on virtually all vertical scales built for K-12 achievement tests. They will be found whether we examine the vertical scales of traditional standardized tests such as the ITBS Iowa Tests or custom-built state assessments such as the CMT in Connecticut or the FCAT in Florida. Interim assessment such as the NWEA MAP reveal the same characteristics. So, although this discussion focuses on the Smarter Balanced scale as the most recent example, the comments apply to any and all such scales. The number of points needed to grow from Level 3 at one grade to Level 3 at the next grade decreases across grades: 41 points between grades 3 and 4; 29 points between grade 5 and 6; 15 points between grades 7 and 8; and only 16 points across the three years between grades 8 and the High School test at grade 11. In contrast, the number of points needed to move from Level 2 to Level 3 within the same grade a) is larger than the number of points needed to move from Level 3 to Level 3 across grades, and b) increases as we move across grades; from approximately 60 points at the lower grades to 80-90 points at the upper grades. It is outcomes such as those and the need to understand all of those numbers to use the scale appropriately that raises my doubts about the value of the vertical scale. What does a score of 2583 mean? One of the primary charges to those developing the next generation, beyond the bubble, college- and career-ready assessments was to provide actionable information to inform instruction. A key component of that actionable information was supposed to be the ability to derive meaning from reported scaled scores. That is, a goal was for educators to be able to interpret what a student with a score of 2583 knows and is able to do in relation to content standards such as the Common Core State Standards (CCSS). How is that possible if a student at Level 3 in grades 6, 7, or 8 each can earn a score of 2583? We know that the content of those tests is not the same; so how does an educator interpret the score? Has the student earning a score of 2583 on three consecutive tests at grades 6, 7, and 8 acquired any new knowledge and skills? Has she or he lost any knowledge or skills? It appears that the answer is that any content-based interpretation must be tied to the particular grade-level test. OK, that makes sense, but it also raises the question, what is gained from a vertical scale? Of course, the answer must be the information that the vertical scale provides about student growth! A change of 25 points would mean that a student has exceeded the number of points necessary to move from Level 3 at grade 7 to Level 3 at grade 8; but is well short of the 41 points needed to move from Level 3 at grade 3 to Level 3 at grade 4. Regardless of the grade level, 25 points would mean that the student has fallen well short of moving from a low Level 2 at the beginning of the year to a low Level 3 at the end of the year. Similarly for higher achieving student, 25 points would be more than the 19 points needed to move from Level 4 at grade 7 to Level 4 at grade 8, but conversely, only one-fourth of the approximately 100 points needed to move from Level 3 to Level 4 within grade 7 or grade 8. In short, with regard to making inferences about student growth, the point differences on the vertical scale are largely meaningless outside of the context of the grade levels involved and the achievement level thresholds for those grade levels. Again, how much is gained from the reporting results on a vertical scale? OK, I admit that burying vertical scales is a bit extreme. One of the first things they teach us as budding psychometricians is that the first requirement and primary consideration in creating a reporting scale is to make test scores more interpretable and useful for the intended audience. If you have not accomplished that, why bother taking the time and effort to create the scale in the first place. In the case of vertical scales, I question whether we are meeting that first requirement. making inferences about student growth. This is the third, and final, installment in a series of three posts based on a workshop presented in April 2015 at the annual conference of the New England Educational Research Organization. Yield Valuable Reports on Student Progress and Performance – Providing timely data that inform instruction (D.2). Reports are instructionally valuable, easy to understand by all audiences, and delivered in time to provide useful, actionable data to students, parents, and teachers. In April 2015, Achieve, Inc. sponsored a webinar and released a set of materials focused on Communicating Assessment Results to Families and Educators. Among the materials disseminated, Achieve produced sample assessment reports, including a model Mathematics Family Report. The two-page report provides the family with information about an individual student’s performance on the fifth grade state assessment in mathematics. The first page of the report provides basic information about the assessment, explains what the results mean, and provides the student’s Overall Score (i.e., scaled score) and Performance Level classification. So far, so good. At the bottom of the first page, however, the family is instructed to “[t]urn to the second page to learn more about David’s knowledge and skills in mathematics.” That is where the trouble starts. At the top of the second page there is a display providing information on the student’s level of mastery in each of five Mathematics Scoring Categories. As discussed in my previous post, What’s In A Name?, the capacity for a state summative assessment to support such claims of mastery is shaky, at best. Achieve, however, does not stop there. The model report also includes a section which contains a detailed description of the student’s individual strengths and weaknesses. There is no doubt that information like this would be extremely valuable for David, his parents, and David’s former or new teacher (assuming the report arrives during the summer). Unfortunately, we cannot expect to receive this level of information from a state summative assessment and should not raise expectations that this level of detailed information about individual student performance is an appropriate target for states and assessment contractors. A state assessment report cannot provide the same type or level of information as a standards-based report card because a state assessment cannot produce that level of detail about an individual student’s performance. The implication in the table of David’s Strengths & Areas For Improvement is that the information provided has been compiled specifically for David. In reality, the list of strengths and weaknesses is likely to be similar to the lists of knowledge and skills provided in performance level descriptions. That is, if that type of information is reported at all it will reflect probable strengths and weaknesses for students with an overall score and/or pattern of performance similar to David’s. However, if David’s performance is anywhere near the middle of the score range there are literally millions, if not trillions, of ways that students could arrive at the same score as David; and repeated analyses over the last fifteen years have shown us that on any given test there will be nearly as many unique response patterns as there are students taking the test. The likelihood that we can identify and describe David’s specific strengths and weakness to the level of detail shown in the model report is a million to one long shot. It would be even worse, however, if that list of strengths and areas for improvements were tied directly to David and based only on his performance on the one or two items on the test that measure multiplication and division of fractions, understanding of the concept of volume, or the use of line plot displays. A student’s performance on a small number of items on a single test may suggest a particular strength or weakness, but by itself is certainly not sufficient to support the claims implied by the statements on the Family Report. The inability to describe an individual student’s strengths and areas for improvement on the basis of performance on a single test is a limitation of state assessment, but it is not a flaw that we can correct. Yes, we can do a better job of communicating state assessment results to students, families, and teachers; but no, we cannot obtain accurate descriptions of an individual student’s strengths and areas for improvement from a single comprehensive assessment. No, computer-adaptive tests are not the solution. Computer-adaptive tests are designed to provide more accurate estimates of a student’s location on the overall proficiency continuum, but in general, are not designed to provide more detailed information about an individual student’s strengths. The call to provide families with the type of information included in Achieve’s model Family Report is admirable and appropriate. The problem, however, was in positioning the Family Report as the report of results from a single assessment. The Family Report, like a report card, can be based on a synthesis of information from multiple sources. State assessment programs like PARCC and Smarter Balanced are offering tools that can be used throughout the year to collect more detailed information about student performance. We should also be able to expect local districts, schools, and teachers to be able to provide families with accurate information on a student’s strengths and areas for improvement. If local educators cannot provide that information, that is the reporting problem that we need to solve. After all, even the model report directs families to contact David’s teachers for information on how best to support David’s learning. This is the second of three posts based on a workshop presented in April 2015 at the annual conference of the New England Educational Research Organization. Proficient. The passing of NCLB made it a national goal that 100% of students would be Proficient by 2014; and the law made it clear that proficiency would be determined by performance on a state assessment. What was not clear from the law was exactly what was meant by the term Proficient. We know that NCLB left it up to individual states to adopt their own content standards and to set their own criteria for Proficient performance on those standards. We also know that there was wide variation among the states in the level of student performance classified as Proficient; but that variation and the claims of honesty gaps and truth telling that flow from it are not the focus of this discussion. the design of the state assessment and the methods used to classify student performance as proficient. When asked to describe the performance of a Proficient student, responses from those not directly involved in the development of state assessments often describe performance that is consistent across standards (and over time) as well as performance that reflects a certain degree of mastery of those standards. Consistency and mastery appear to be two critical elements to common interpretations of Proficient performance. As shown in the examples below, consistency and mastery are often found as key components of state policy-level descriptions of student performance at the achievement level corresponding to Proficient. When we dig a little deeper, state content area descriptions often go into great deal about the knowledge and skills of students performing at the Proficient level. The following example describes the performance of students proficient in grade 6 mathematics. The problem is that in most cases there is a disconnect between the specific claims made in those descriptions of Proficient performance and the design of the state assessment. In general, state assessments are comprehensive surveys of the ranges of content standards within a grade level. They usually contain no more than a few questions measuring a particular skill such as solving for the missing angle in a triangle or setting up proportions from concrete situations; certainly not enough items to claim consistency or mastery of the skill. The table below shows the percentage and number of points assigned to the four broad clusters of mathematics standard on the 2011-2012 NECAP sixth grade mathematics test. M(N&O)–5–2 Demonstrates understanding of the relative magnitude of numbers by ordering, comparing, or identifying equivalent positive fractional numbers, decimals, or benchmark percents within number formats (fractions to fractions, decimals to decimals, or percents to percents); or integers in context using models or number lines. How many different skills are contained in that single standard, and how many items would be needed to determine that a student had mastered each of them? Most important, to be classified as Proficient on a state assessment, a student may only have to earn 65% – 70% of the points on the test. It is difficult to make claims of mastery and consistency when a student has earned 70% of the points on a test. Let’s consider two students, Sue and Kevon, who each earned 70% of the points on the test. We do not know whether Sue has mastery of calculating percentages, adding negative integers, and understanding measures of central tendency. We do not know Kevon has performed consistently across all of the standards or clusters of standards. We do not know which items Sue and Kevon answered correctly, or perhaps more important, which items each answered incorrectly to earn their score of 70%. We do know that there are more ways to earn a score of 70% on the six grade mathematics test than there are students in the state; but this topic will be considered in more detail in the final installment of this 3-part series of posts: One in a Million, A Million to One. So what do we know when a student has earned 70% of the points on the sixth grade mathematics test? We know that the student earned 70% of the points on a test that contains items assessing a representative sample of grade level standards, and that the state has determined that level of performance to be Proficient. We expect Proficient students to be prepared to succeed at the next grade level, but based solely on the state assessment we cannot know what specific skills an individual student has mastered. Whatever the reason, we can determine how well performance on a mathematics and English language predicts whether students are ready for college – even if they never plan to take a formal mathematics or English course in college. There is much less room for misinterpretation with college ready than there was with Proficient. A college ready student is a student who is ready for college. Sure, we can worry about things like what kind of college and how ready, but why quibble over details. By focusing on the predictive power of the test rather than its content, what we may have to give up, however, are claims of a tight link between a student’s test score and the specific knowledge and skills that the she has mastered. As they say, however, can you really miss something you never had to begin with?